"Oh God!!! I'm down." A response I most definitely was not expecting from my super athletic, boxing enthusiast partner when I mentioned doing a cleanse. Just like that we committed to doing a 3 day tonic cleanse by way of Hey Gouter. Something totally different and challenging enough for us both to tackle for our November discipline week. 3 days. 6 tonics. No solid food. 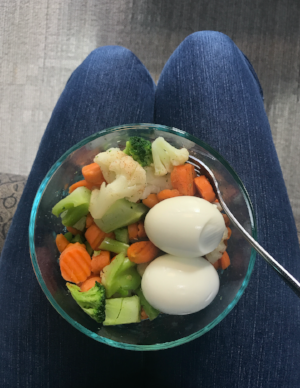 Hmm being that I didn't want to lose any weight this was a little intimidating so I decided to do a modified one where I'll allow myself to have liquid soups, nuts, and steamed veggies. Well for me I have not been very good to my body when it comes to food. Heck I just had Popeyes for dinner the week prior and lets not mention my consistent Taco Bell cravings. I felt like a cleanse would first shock my body and then maybe those cravings would subside. In addition, I was curious to see the results of bloat reduction, and giving my gut a rest from breaking down solid food. They say you should prep your body at least two days in advance by reducing or eliminating meat, dairy, and processed foods. So umm yeah with good intentions we both failed. I had pizza Friday, a Takorean chicken bowl Saturday, and Sunday was a yummy French toast, eggs, and bacon brunch day followed by some Turkey Chili for dinner. Fail! Hmm this might be a bit harder than I thought. Sunday night, after picking up our orders I opened them and found out that the yummy nutty protein melk I had requested for each day wasn't here. Tonics only. I think out of a bit of panic I immediately thought, "I can't do this. Seriously surviving off of tonics alone?! No way!" And there was the fact that I'm a planner and had set to do this Monday through Wednesday that way I'll be back on solid foods by the time I have to teach my yoga classes Thursday through Saturday. With a couple of bumps along the way, I grew very frustrated but after talking with V, Hey Gouter's lovely owner, we worked everything out and I ended up getting the melks on Tuesday. When I woke up Monday, I had shaken off my frustration and was ready to do this thing! The morning wasn't bad. I made it through tonics #1 and #2 with no problem. However, around lunch time I started feeling hungry. I ran to the market and grabbed some almonds and pistachios and inhaled a few as I drank tonic #3. #4 was supposed to be my melk which was going to be a bit more "heavier" and filling but I drank the tonic and pushed forward. By the time I made it through tonics #5 and #6 it was 6pm and I had a major headache. They say expect to have a detox headache from the lack of caffeine but I was hungry! I had some tomato and red pepper soup with a few more nuts around 8pm and was good to go! Day 2 I was going to allow myself to have some steamed veggies and I knew I was getting my melks so I was a little more hopeful. I ran through the tonics, had my veggies for lunch and then the yummy green matcha melk as I wrapped up my work day. No headache. A little bit more energy and a lot more positive. I had a little butternut squash soup for dinner but honestly didn't feel very hungry. Day 3. The last and final day! I allowed myself veggies and eggs for lunch along with all of the tonics so no fear. This was the best day. No hunger pains, no cravings, and I honestly feel great! I feel like my belly bloat has gone down tremendously. After the cleanse I honestly wasn't even craving any meat and feel like I could go full on vegetarian if I wanted. I stayed true to my discipline and am extremely proud of myself. Lemon mouth! Because most of the tonics contain lemon I felt like it dried my mouth on so I had that constant feeling of thirst though I was drinking all day. I definitely recommend drinking a good amount of water along with the tonics. Sugar and lack of daily nutritional content in the tonics. So there you have it, my good, bad and ugly of completing a tonic cleanse! Would you ever do a tonic or juice cleanse?